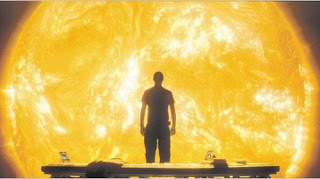 Sunshine was a movie made in 2007 by director Danny Boyle. Overall the science in this movie wasn't terrible. There was one scene, however, that made me cringe. About 1 hour into the movie, several crew members get stuck on a second ship which has had the airlock blown out. There is only one space suit, and no other way to return to the main ship, or pressurize the airlock area once the seal has been breached. They come up with an idea to try to get as many crew as possible back to the other ship. They put one crew member in the suit and have the others wrap themselves up tightly in insulating fabric, then they tie themselves onto the suited member. Using the gas pressure from the damaged ship when the airlock is blown, they will rocket across to the other ships airlock and live. So far, this is very good. The gas would expel you across the gap pretty quickly, and it's possible that you could survive a very short exposure to hard vacuum. Further, the tight wrapped insulating material would help protect you from the vacuum to a certain extent. The problems occur shortly before they launch from the airlock. The crew members who remained on the main ship inform them that they will have "20 meters to cover at -273 degrees Celsius". Although this temperature would be more accurate for deep space than this close to a star, since they are behind a solar shield and would be likely to round the temperature to the nearest whole number, -273 Celcius is a reasonable temperature. After wrapping themselves up in insulating material torn from the walls of the ship, they blow open the airlock and start to shoot across the gap. Oh no, one of the crew members got knocked off a strait trajectory and has drifted off into space unable to be rescued. At this point, due to the great cold of space, he quickly freezes into a astronaut-sicle. Wait, is that right? Freezing in about 1 minute is what you would expect in an atmosphere at that temperature, but what about space? In space, temperature doesn't mean the same thing that it does on earth. When you are in an atmosphere, the temperature has to do with the thermal energy possessed by the air. It turns out that in air, Newton's law of cooling describes the rate at which things cool fairly accurately. The rate of change of thermal energy equals the heat transfer coefficient of your medium times the area of your object times the difference in temperatures. For air, the heat transfer coefficient is between 10 and 100 watts/meter^2 kelvin. So, for very large temperature differences, this will cause you to cool very quickly, linearly increasing as the difference decreases. In space, a much different process occurs. It turns out that radiative heat transfer is proportional to the difference between the 4th power of the temperatures (body^4 - ambient^4), which would be very fast, but the constants on the front are very tiny. Specifically, a given object with an identical temperature difference would cool 6 to 60 times faster, depending on atmospheric composition, in an atmosphere as compared to in a vacuum. That gap will widen very quickly, since in a vacuum the loss rate changes proportionally to the temperature to the 4th power. If you do the math, using the approximation that a human is a sphere with a surface area of 1.81 meters, an emissivity of 1, and a mass of 80kg of water, you get that after 1 minute the temperature of his body would only have dropped to 308K, from 310K, which is well above the freezing point of water. In fact, it would take more like 45 minutes to even reach freezing. So, that scene, although very dramatic and cool, was kind of silly. I admit though, the much more realistic thing to have happen would be some nasty things coming out of all your orifices, and it would be much more disgusting than what they chose to portray. Go rent Sunshine though, it's a very pretty and thrilling movie! Edit: New exciting information! It turns out that according to the FAA and NASA, you won't actually be able to stay conscious very long if exposed to hard vacuum like that. The amount of time that you retain useful consciousness in rapid decompression situations would be on the order of 5-10 seconds if you were breathing normal air before the decompression. What this means is that it is unlikely that the unsuited crew members would have been able to act in any way once exposed to space. Further, the damage taken would be so extreme that they would need immediate medical attention to survive and would in no way be active after exposure to space. This scene gets less plausible as I learn more. I must point out that you'd spray blood out of your nose like a giant aerosol can. Because you'd be operating under exactly the same principles. Your blood pressure is about 3psi, and is used to an atmosphere of about 14psi. Remove those 14psi of containment, and SPLUUSHHHHHHHH--your face 'asplode. And that's BEFORE we even consider blood effervescence. Thanks Steven. He is correct Chris. Without any atmosphere to conduct the heat from the suns rays, you have to be in direct sunlight in order to receive any heat from it. Actually at this distance from the Sun, you'd have lot of material around - solar wind particles, dust, essentially the sun "atmosphere". They'd be toast in an instant. Sunshine is very very cool movie, but extremely silly. 1) Probably, of all the preferences, this casino is my favorite.rare uk casino I like everything in the casino, the roulette is excellent, I am glad that during the game you can also talk to people who also play at the same table! Muzychka great. With the conclusion there were no difficulties at all. Easily raised from $ 30 to $ 600, withdraw. Played, played, will play!